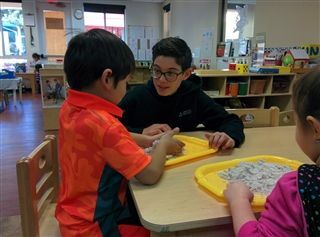 Each week, Middle School Service Learning students visit preschoolers at Carlsbad's Head Start facility. The students read, play outside, and conduct crafts with the children. They've also been helping the preschoolers learn their shapes, colors, letters, and numbers. Head Start, a program which helps promote school readiness for young children from low-income families, has been a longtime partner of Pacific Ridge's Service Learning program. Through relationships with their "little buddies," students have gained patience and compassion, and look forward to the weekly opportunity to laugh and play.